Best Medium Housebuilder Hill – Congratulations! 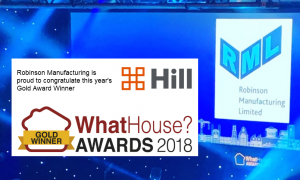 Robinson Manufacturing is delighted to congratulate Hill, who won the Gold award for Best Medium Housebuilder at last week’s WhatHouse Awards in London. Hill is a recognised industry leading housebuilder, providing quality, distinctive new homes across London and the South East, founded in 1999 by Andy Hill, Hill delivers both private sale and affordable homes in London and the South East of England. Hill’s vision is to be the leading, most trusted provider of distinctive, quality new homes in the UK. Hill employs over 400 dedicated staff who are passionate about the houses they create and the manner in which they work. Their head office in Waltham Abbey is an award winning campus developed from a number of redundant Victorian industrial buildings; they also operate from regional offices in Bicester, Cambridge, Crawley and Norwich. Hill’s developments range from city centre apartments and spacious family homes for growing families through to large luxury residences. Our congratulations also go to Silver Award winners Spitfire Bespoke Homes, as well as to William Davis Homes and Churchill Retirement Living, who were given Bronze Awards in this category. The winner of this award joined the winners of the Best Small Housebuilder and Best Large Housebuilder in competition to win the overall Best Housebuilder award, which this year was won by another Robinson Manufacturing customer Redrow.